Zero growth. The Land Transport Authority (LTA) announced in Oct 2017 that from Feb 2018 (i.e this month), the growth rate for private cars and motorcycles will be revised to zero. We can expect this freeze in vehicle population growth to exert upward pressure on COE prices in the years to come unless there is a substantial change in our mindset for private vehicle ownership. This is but one of the many measures to move Singapore towards being a “car-lite” society. With this move, what is the future for private modes of transport, and how does that affect your requirements for car insurance (or bike insurance) and other insurance coverage such as personal accident insurance? It has long been an observational joke in Singapore that we aspire to the 5 “Cs“ – Cash, Car, Credit card, Condominium and Country club. Of these 5 “Cs”, car ownership is in particular seen as a hallmark symbol of success – where else in the world will people have to pay so much for the convenience of a car? When you buy a car in Singapore, you also pay a dizzying array of taxes, yearly maintenance and repairs, carpark charges, car insurance, and of course, the mother of all car costs – the Certificate of Entitlement (COE) – a measure put in place to curb the rise of car ownership instituted way back in 1990. 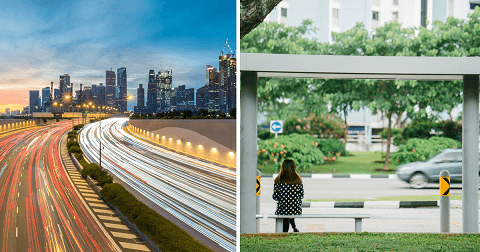 With increasing environmental awareness and increasing limitations on available road space in Singapore, there is now a stronger push towards transforming Singapore into a car-lite society. What this holds for private modes of transport is that we are likely to see more people move away from private transportation to alternative modes as they become more viable options. I’m For Change. What Are The Alternatives? If you decide that you can do without a car, or are willing to drive less, good for you! There are fortunately plenty of options. As mentioned in LTA’s Oct 2017 news release, the Government is committed to investing in, and improving rail and bus public transport in Singapore, so these will undoubtedly continue to be the main alternatives for most people going car-lite. “Shared” modes of transport, such as taxis (including services such as Grab and Uber), and new car-sharing services, allow for some of the convenience of private transport without the hefty upfront investment. Or you can choose to take the healthy route and ride a bicycle instead. If you give up private vehicle ownership altogether, you no longer need a car insurance (or a motorcycle insurance, as the case may be). However, do consider instead protecting yourself with a personal accident insurance plan. Etiqa’s ePROTECT safety plan’s personal accident insurance coverage includes protection against accidental death and accidental permanent disability, and also provides other benefits such as medical expense reimbursement and hospitalisation benefits. If you use personal mobility devices such as bicycles, kick scooters and electric scooters, you can consider the ePROTECT mobility plan, which is specifically tailored for mobility device users and includes personal liability coverage. On the other hand, if private transport is still going to be part of your future, but you intend to drive less, Etiqa has a usage-based car insurance plan – ePROTECT sMiles that can help you save. For the hard-core car lovers, or those that depend heavily on private transport to make a living, there may be no choice but to pay for the privilege of owning the second most expensive asset after your home. Choose your car wisely, maintain it regularly, and protect it with a good car insurance (or a good motorcycle insurance if it is a motorcycle you own). Look to Eqita’s range of motor insurance products and watch out for the Thank Etiqa It’s Friday deals for savings when you get your motor insurance. Whichever option you choose for your transportation mode – continue driving, drive less, public transport, or shared transport, Etiqa has an insurance plan to ensure that you have good insurance coverage. Committed to humanising insurance, Etiqa has made these conveniently available for purchase online. Protecting more than 300,000 homes in Singapore since 1961, Etiqa is best known as the appointed insurer for the Singapore Housing Development Board (HDB) Fire Insurance Scheme. Etiqa also provides comprehensive life and general insurance solutions solutions with affordable and transparent insurance premiums. These include motor insurance (including motorcycle insurance), travel insurance, home insurance, maid insurance, , insurance savings plan, retirement and legacy planning. Etiqa is one of the first insurance companies in Singapore to empower its customers with online insurance, offering innovative, customer-centric experience such as real-time travel delay insurance and usage-based car insurance.